Leaders & enders--I had heard of them several times in quilting books, but remained unconvinced that they were a good idea. It seemed like the quilt police were telling me what to do and I didn't really see the point. 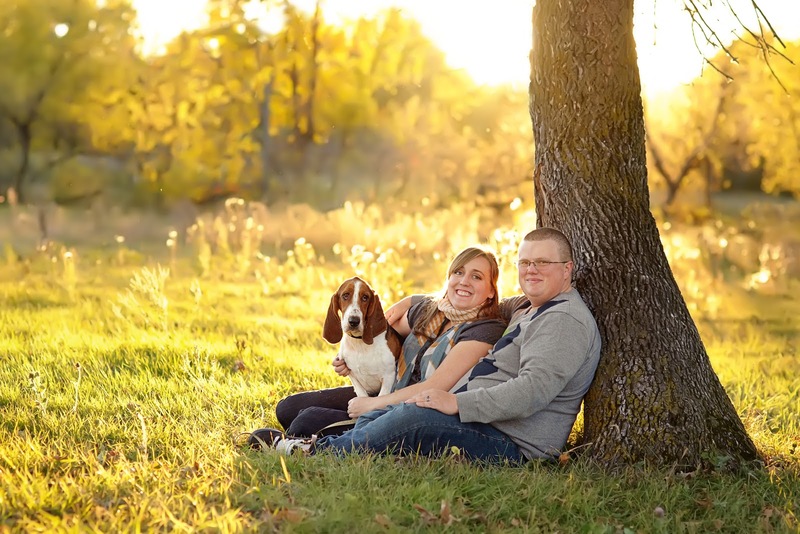 I recently became a convert, though, and I thought I would share why. Leaders and enders are scraps of fabric that you put through your machine at the beginning and end of a batch of chain piecing. The theory is that prevents the little rat's nest of threads under your first pair of pieces in the chain that adds bulk and wastes thread. I have an automatic cutter on my machine that leaves pretty short thread tails, so I had just dismissed those nests as an unavoidable nuisance--there was no way I was going to take the extra time to sew across a scrap of fabric at the beginning and end of my chains. However, I came across the idea that instead of using a scrap of fabric for a leader or ender that just becomes increasingly clogged with thread and winds up in the trash, you could actually feed a matched pair of pieces from your scrap bin or a different quilt through at the beginning and end of chain piecing. This way, if you have a bunch of pieces cut up and ready to go beside your machine, a quilt will slowly build itself in the background. When you are ready for that quilt to become your main project, a good chunk of it will already be finished! I got the idea from Bonnie Hunter of Quiltville.com. I requested her book, "Adventures with Leaders & Enders: Make More Quilts in Less Time!" out of the library right away and read it (I had to request it by interlibrary loan). I liked it so much that I bought it--and I rarely buy quilt books so that is saying a lot. The patterns in the book are more on the traditional side, but lately I have been feeling more traditional anyway (will I get kicked out of the MQG for saying that?). I can see myself making most of the quilts in this book over time. 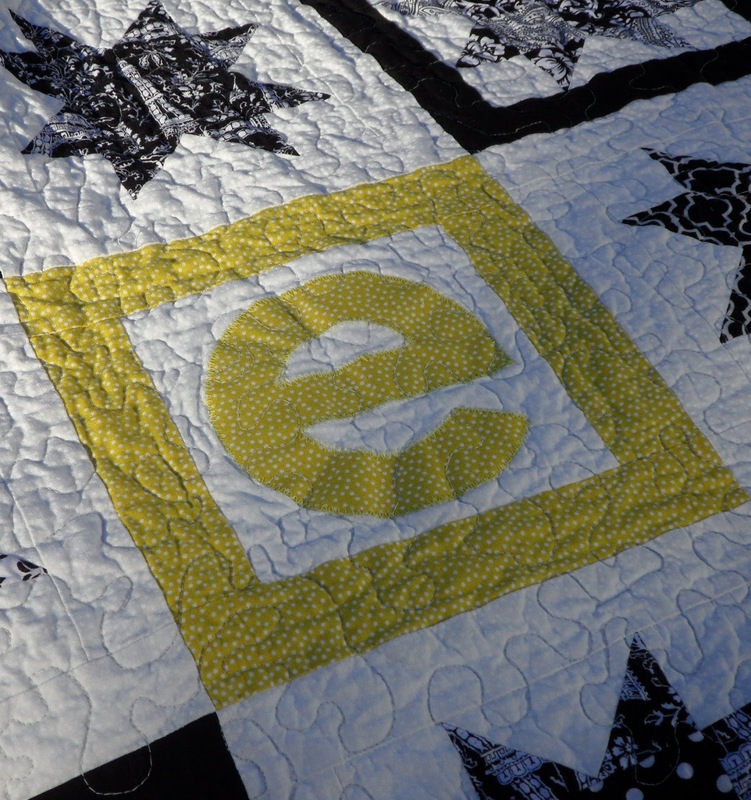 You can read more on Bonnie's Leaders & Enders page, where she talks about her inspiration and shows a few of the twelve quilts that are in the book. She has a large number of scrap patterns and tutorials on her website as well if you look in the right sidebar. I read the Crumbs, Crumbs, Crumbs page many years ago and it was particularly dangerous for making me keep every single tiny scrap in the hopes of using it later. Anyway, I began putting the leader & ender system to use right away. Right now I am working on a very big quilt that uses the square on a rectangle method of making flying geese. This technique is great, but you wind up with a lot of leftover triangles (in my case, 800). So, instead of stuffing these triangles into a scrap bin where they would get wrinkled and take up space and guilt me, I kept them paired as they were originally when I trimmed them from the geese and stacked them beside my machine. Throughout the course of finishing my quilt top, I have nearly finished piecing all of these bonus triangles into 400 two inch half-square triangles. That is almost another quilt in itself! In our continuing series on quick charity quilts, I thought I would choose a design and see how long it took me to finish a top. I wanted to start with a bright and happy palette without getting too frenetic, so limited my choices to two colors: yellow and pink. Varying the tone of each gave the quilt some sparkle. As I began creating strip sets, I placed each strip deliberately, choosing which other fabric strips to place around it. It soon became clear that placing the colors in such a manner would take a lot of time, so I made piles of strips and grabbed randomly, only putting them back when I had already used that particular print in the strip set. The strip sets went together quickly after that. Unsewing each sliced strip set took longer than I expected, but the pretty 12" blocks were worth it. Cutting the fabric took approximately an hour. Assembling the blocks took another 12.5. I forgot to keep track of how long it took to sew all the block together to create the top. The entire process took a week, sewing after work and on the weekend. Honestly, it wasn't as quick as I had thought it would be. BUT if you increase the strip size, you could make it much faster! Strips cut at 4 1/4" will make a simple, generously-sized baby quilt with just 4 blocks (45" square finished, each block 23" unfinished). Strips cut at 3 1/2" will make a row 6 feet wide with only 4 blocks (18 1/2" each unfinished) - choose your finished quilt size by adding rows below. Increase the strip size to 6 1/2", and in just 2 blocks (36 1/2" each unfinished), your row will be 6 feet wide. All in all, it took a little longer than I expected, but is still a relatively fast quilt to make for charity, especially if you alter the strip size. At each month's meeting we have a block lottery or a quilt block swap. If you are new to our group or blog, you can read all the general information about our block lottery here. For February we will be making Fractured Star blocks designed by Nancy Miller. Here is a link to her tutorial. The blocks will be 12.5 inches unfinished. I used HSTs rather than following Nancy's tutorial, however for directional fabrics I would suggest using this tutorial. 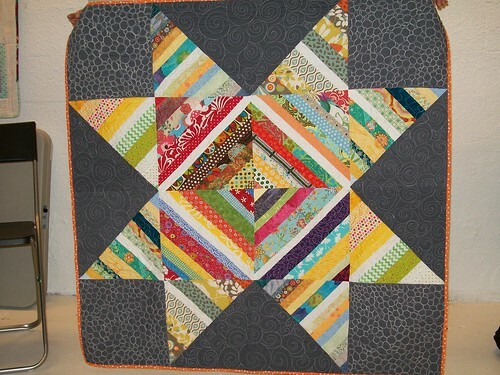 Blocks should use Kona Chartreuse paired with black and white fabrics. 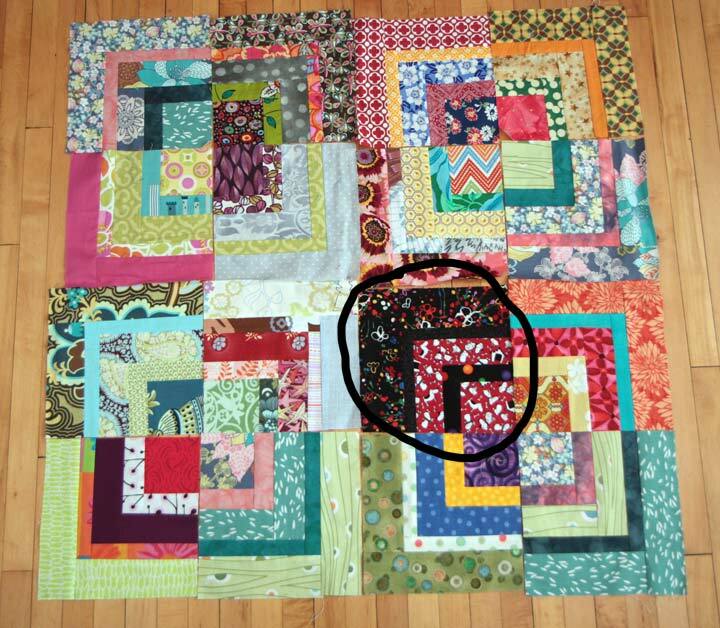 If you make more than one block (three are allowed), please try to change up your fabric selections or positions so that no two blocks are identical. Whenever I'm asked to make a quilt for charity, I usually go straight to a set of patterns I know almost by heart. And while I've made many of these go-to patterns a half dozen times, I've always wanted to come up with an even faster approach for making charity quilts- a signature charity quilt if you will. Something that takes only an hour or so for the top- so I can get right to the quilting and binding and so the quilt can then get to its new home as soon as possible. On the flip side, I still want the quilt to be good quality and beautiful in spite of its simplicity and I want to be proud of the design. Inspired by so many of the quilt backings I've seen online and during Show & Tell at our monthly MMQG meetings, I came up with a "One Block Quilt Top". Now, this is truly a minimalistic approach- and I'm sure you can find ways to add a few more blocks or set them a little differently to add complexity and achieve a different look. Most charity quilt requests are for twin size quilts or slightly larger, so I designed the One Block Quilt Top to be 70"x90", but of course you can always modify the size to accommodate the fabric pieces you are working with (and as a side note, my design might not be the most suitable for an actual bed spread since the placement of the featured block could complicate how the quilt hangs over the edge of the bed). 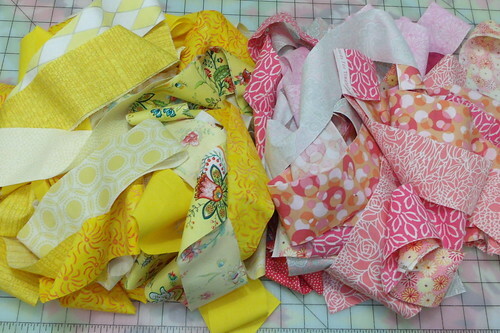 I started by raiding my extra block bin for a block I wanted to use in my quilt. I didn't make the one pictured below. It was part of a huge bag of scraps I purchased a few years ago at the Textile Center's annual garage sale. I really like the sweet calico-esque prints- though they aren't in colors that work with my home and I wasn't sure how I would be able to use them so I stashed them away along with extra blocks I've accumulated over the years waiting for just the right project. If you don't have a collection of stray blocks like this, you can of course make a new one in any style you choose. After you have selected the block that will star in your quilt, the next step is to determine how much extra fabric you need in order to turn it into a quilt. 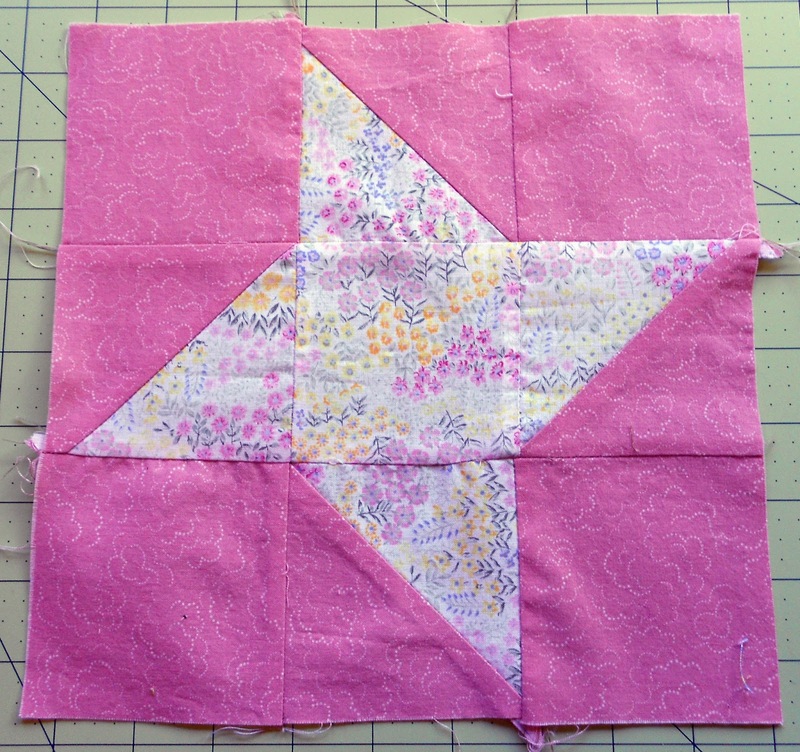 But before you can take that step, you need to decide how you want to set the block in your quilt. I did some quick sketches to make my decision but if sketching isn't part of your process, you can certainly use a design wall or just lay the block out on the table in a variety of ways until you like what you see. I chose to use a thin border (2") of contrasting fabric before setting my block in a natural colored horizontal stripe- but there lots of other options too. With that decision made, all that is left is to determine the fabric requirements for the rest of the top and sew it together. Here is a final sketch for the quilt top I chose to make including all of the yardage and piece measurements required to assemble it. With a little massaging, you can use this basic template to create a whole different look by setting the block on point, altering the placement of the strip the block is set in or even adding a few more stray blocks in need of a good home until you come up with a signature charity quilt of your very own. Today I am reviewing Robert Kaufman's Quilting Calculator App that is available on iTunes and on Google Play for Android phones. User reviews on both sites give this free app relatively high ratings. Fabric Measurement converts between inches/fractional yardage/decimal yardage. Batting & Backing calculates needed yardage. For a 94x94 quilt that I am currently piecing I plugged in those dimensions and added an 8" desired overage for my backing and determined that I needed 9 1/4 yards of backing for my project. Piece Count allows you to input the dimensions of your desired fabric piece and what you are cutting from to determine your yield. I should get 12 - 5x5 charms from a fat quarter according to the calculator. Pieces to Yardage Area determines yardage needed for specified number of pieces. For a recent charm swap I needed 50 charms and the calculator told me to buy 1 yard of fabric. For my 94" inch quilt the Binding Calculator determined that I need 9 strips of the 2.5" width binding strips I selected for a total yardage of 5/8...and if I wanted bias binding also gave yardage at 5/8. I found the border yardage helpful for a recent purchase. I was buying a stack of FEs for blocks for a queen size quilt but needed to estimate yardage for a narrow inner border and outer border. By entering in a 90 x 90 quilt with 2" and 8" borders I found that I needed 5/8 yard for the inner border and 2 3/8 yards for an outer border. The calculator also gave me the option to select mitered borders if I wanted. Square in a Square works out all the dimensions for a square in a square block using either the finished inside square or the finished outside square dimensions. Despite being a math/numbers person that loves geometry and does a lot of calculations in my head, I have to say I like this app a lot. There are so many times as a mom that there are just too many things going on at once that it is nice not to have to think...even alone in the store without distractions. There are many useful calculators on this site that make it worthy of a definite thumbs up. Advertising on the app is minimal, there are links to Kaufman's blog and other sites but only if you select them. So if you are a quilter and have a smart phone or an i-pod, this app is for you. I have a neglected blog at www.sewtif.wordpress.com. I am working on getting better at regularly. I crochet, embroider, am slowly teaching myself how to knit ( it is not pretty) as well as enjoy painting and repurposing furniture as well as fixing up our old home. I have been quilting/sewing for about 1 1/2 years. I learned a bit from a friend but the vast majority I learned from trial and error. 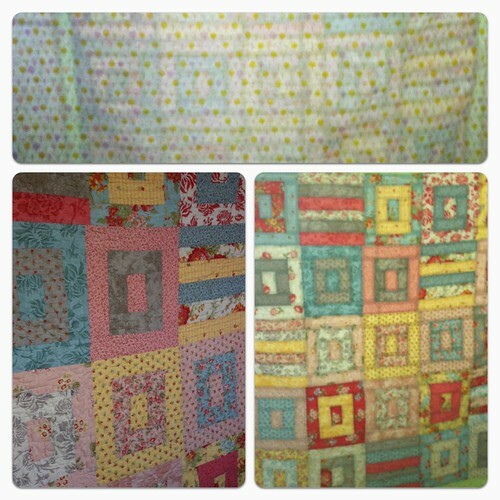 I have made 4 complete quilts with 1 more on the way. I have a few UFO's but they are mostly from other crafty adventures. It depends on the week. I usually quilt anywhere between 4 - 8 hrs/week. But that can greatly varies depending on life. The first quilt i made was an oversized queen quilt for our bed. I learned a lot from this quilt, mostly cutting straight really matters, as well as sewing straight matters. I can't remember how many times i had to re-cut the blocks. I also learned that Free Motion Quilting is not as easy as it looks. Overall, I really love my first quilt. It was a fun adventure, and though it took me a long time to do i really enjoyed the experience. 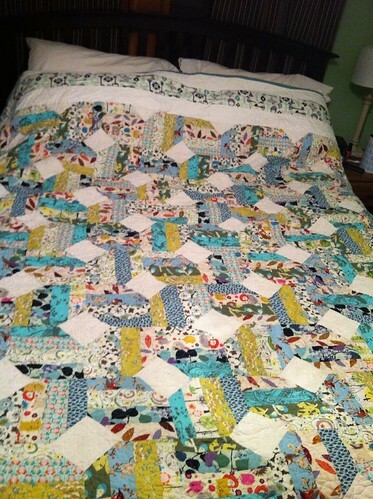 My favorite quilt I have made, has to be the one I made for my Mom Last Christmas. It was a simple quilt, but it was fun and her enjoying it so much made me really proud of my work. I have an office on our main floor that I sew in. I really love the space.It has a lot of good natural light and storage for my stash and other crafty endeavors. I usually only try to purchase Fabric when I have a specific quilt in mind. except for the basic stash building solid and etc. However, I usually have enough fabric for a good amount of quilts or projects at a time. My favorite part of quilting is the piecing and seeing the quilt come together as well as the quilting. I really enjoy trying new types of free motion quilting. My least favorite is cutting. No matter how hard I try.. straight lines and I don't see eye to eye. I really dont have too many goals. I hope to make more quilts and enjoy them. I would really love to learn new techniques and new ideas for quilts. I would also like to create my own patterns someday. I would really love to learn more modern free motion quilting such as Angela Waters' style. I love her style and though I practice, I feel I am not catching on as fast as I would like. Colors and shapes. I really like the way someone can create such different ideas and make different styles, and layouts with the same fabrics. Don't get overwelmed. Take it one piece at at time. 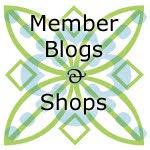 Many of us quilters participate in bees or swaps--I participated in a few of these last year and was lucky enough to win one of our guild block lottos. Last year I also got a stack of blocks from our Bento swap with the Baltimore Modern Quilt Guild, and another stack from our guild Granny square cookie swap. First, in the case of the cookie exchange, I think in part because there was some confusion with the directions, all the blocks were a different size. The block size varied by almost half an inch, which is just too much to ease in a 9 inch block without winding up with a puckery, wonky looking quilt. Second, for the Bento swap, one of the blocks I received has bright red and black in it, which was not part of the plan (my block quarters have muted pink and teals). Finally, in the case of the block lotto, I won an odd amount (28 six inch blocks) that at the time I couldn't think of a way to easily translate into a quilt of a reasonable size without making more blocks (which I did not want to do). Argh! What was I going to do with all of these? I wanted to post about these problems and a few different ways to deal with them in case the same thing happens to you (surely I am not alone!). I am sure that you have seen some of these ideas before. 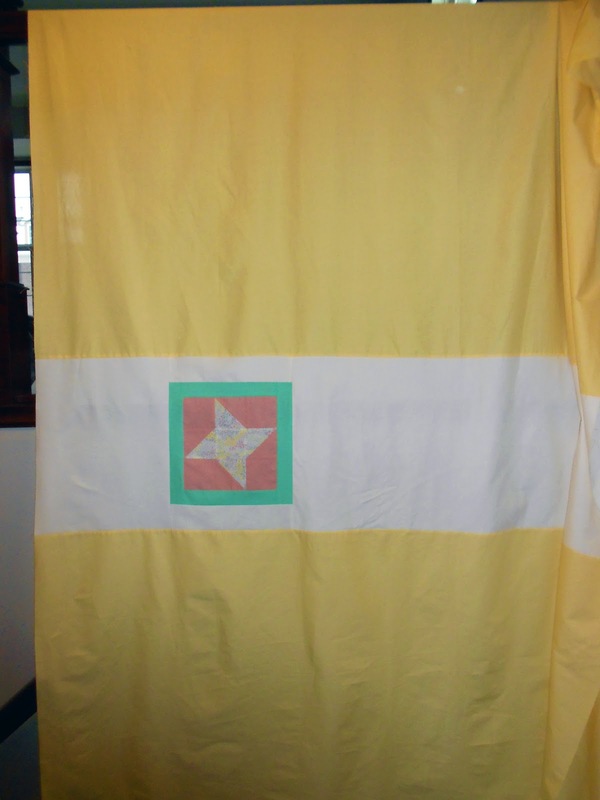 Also, in our guild we are starting up the monthly block lotto again, and I want to see more finished lotto quilts! First problem: blocks are not all the same size. Slight variations in block size are not too much of a problem--I usually feel comfortable easing in about 1/4 inch in a 12 inch block. Much more than that and you might want to fix things before you sew your blocks together. There are basically two different options: Add on or trim back. If you don't have any important elements, points, or whatnot around the outer edges of your blocks (for example, an improv block, a wonky log cabin, or a string block), it is easiest to just trim all of the blocks to be the same size as the smallest block in your stack, centering the design in the newly-trimmed square if necessary. This is what I did in the case of the cookie exchange. All the corners of the grannies went right to the edge of the finished block so trimming was not an option. Fortunately we had all used a very similar white as a background color, so framing each block with white and squaring it up did not stand out. I started by carefully trimming each block to exactly ¼ inch larger than the corners of the granny. I then added a narrow (I think one and a half inch) strip around the outside, and trimmed each block to be the same size as the smallest one in the stack, making sure the original granny was centered in the new block. If you try this, choose a size of coping strip that is large enough that a small difference in size between the blocks will not be as noticeable--try one and a half to two inches or so. Or maybe the difference in sizes of strips will be a design detail--it might look neat to have ¼ to ¾ inch frames in a contrasting color around each block. Use coping strips to make all your blocks the same size. You have some choices here--coping strips can blend in or not, can be all the way around, top or bottom and one side, or just on one side. You have probably seen these at work before in quilts that use blocks of different widths in the same column--the narrower blocks simply have strips added to them to make them the same width as the wider blocks. After I added the coping strips to my blocks, the interior components of the blocks didn't line up with each other very well, so also I added sashing to disguise that a bit. You could also try alternating types of blocks (including using plain blocks). This way the blocks not quite lining up should be much less noticeable, depending on your choice. Second problem: blocks you get in an exchange contain an unexpected color. perform "block surgery" and rip out the troublesome piece(s). For example, this is my stack of bento blocks. I think they all look pretty good together, except that one bright red and black one (the block itself is fine; it just really stands out). I was always planning to make some string blocks to make the quilt bigger. To make the black and red "blend" a little better, I will make sure to sparingly use some black and red in my string blocks and scatter/balance them mostly evenly throughout. That way there won't be just one block to really stand out. I have resorted to block surgery a couple of times, and it is not pleasant, but in those cases there was no other choice. If a piece of a block just doesn't work once it is together and you can't or don't want to remake the block, you can carefully rip out the piece, even if it is in the middle of the block. Then, use the extracted piece as a template for cutting out the new piece, and very carefully sew the replacement piece in. This won't work for every type of block and it is a major pain, but perhaps less painful than looking at a finished quilt and hating that piece forever! Third problem: the blocks just don't look that great together, and/or there aren't enough of them. While the example below is fairly traditional, you can use these ideas for any type of block. Let's take a look at an approximation of my stack of lotto winnings: snowball blocks, all set next to each other. I think these look ok. However, I received 28 six inch blocks, which created a tiny, odd sized quilt if I wanted to use them all in the top and not make more (4 blocks x 7 blocks = 24 x 42 inches). 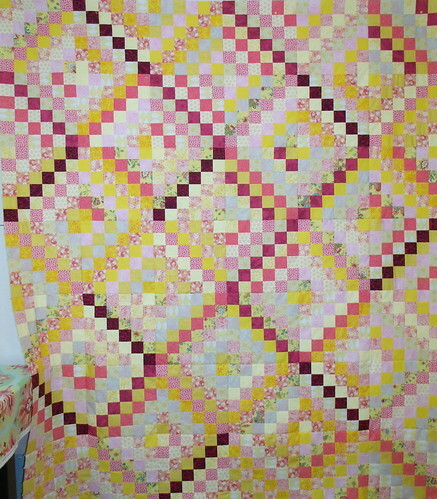 Even adding two blocks would have made a quilt that was only 30 x 36 inches. There are a few different tricks you can try to get everything to look more planned and pulled together instead of just making more of the original block. 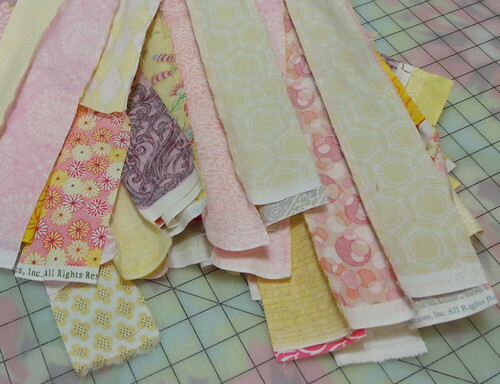 As a bonus, all of these tricks will also increase the size of the finished quilt. Use a unifying color or colors to bring everything together. If the blocks look too disjointed or too noisy when placed next to each other, try spacing them farther apart by adding coping strips, sashing (with or without cornerstones), borders, plain or pieced blocks, etc. in a color that goes with and brings together all of the blocks. Neutrals can be a good choice for this, but many things could work. Try white, cream, gray, navy, or even black. If you need to add just width or just height, the horizontal and vertical sashing don't have to be the same size, or you could alternate your blocks with a narrow row or column of plain blocks or strips. Snowballs set with white sashing and blue cornerstones. Snowballs set with dark gray sashing, light gray cornerstones, and alternating rows of plain blocks to add width. Snowballs set with long narrow strips to add width. Add lots of negative space. This will both tie your blocks together and make your quilt much larger. It has the added benefit of being really quick and easy! Make more blocks, but not necessarily the same block. For my quilt, I didn't want to make more snowballs. I thought instead I could sew four rows of seven snowballs and then made a few nine patches and stars so I could just alternate rows of snowballs, nine patches, and stars. Now that I see the other options, I probably would not have done it this way, but that's ok. Adding stars, nine patches, and a little space with an off-white solid. 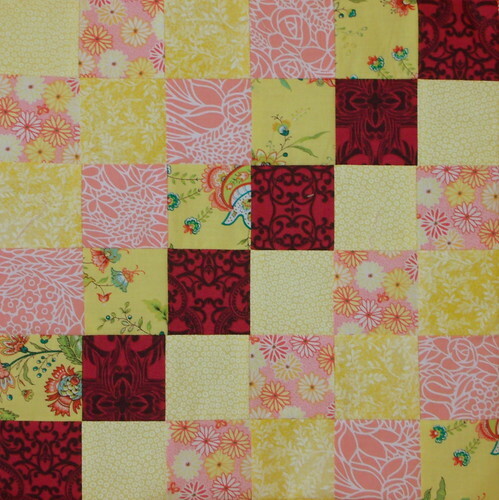 Alternate scrappy blocks with easy blocks that are all the same or similar in color. 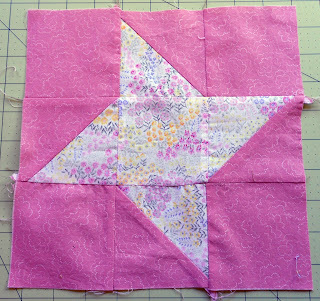 Try any kind of easy linking block, like a 9-patch, snowball, pinwheel, quarter square triangle, shoo fly, etc. 9-patches are really fast if you strip-piece them and are a great choice. If you also make all the linking blocks about the same color, it really ties everything together nicely. And a nice bonus to this idea is that the quilt about doubles in size. I kind of wish I had been less stubborn about using all the blocks in the top and just alternated the snowballs with a nine-patch. I could have used the extra three blocks in the backing. Alternating with identical nine-patches, all in blues and greens. Alternating with nine-patches, in black and cream. Alternating with a kind of a single Irish chain. 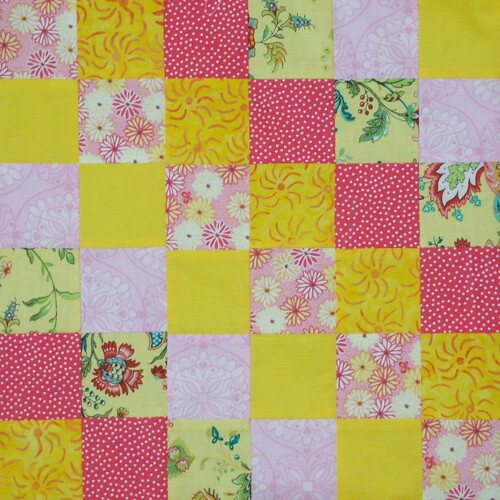 Alternating with identical shoo fly blocks, in brights and cream. Alternating with shoo fly blocks, in black and cream. Alternate with plain blocks and simple linking blocks. 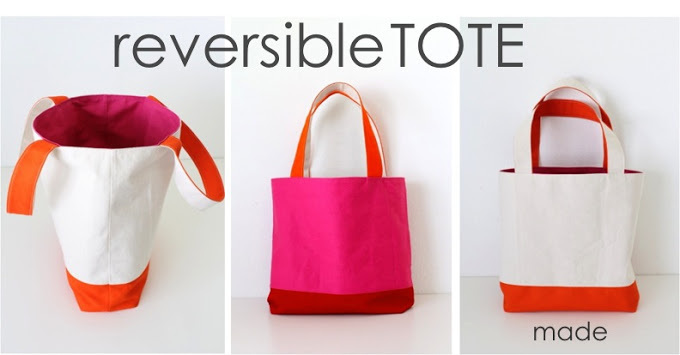 This is great if you want to make your quilt a fair bit larger. It might not have been my first choice for this snowball quilt, but for a star or other complex block, this would look beautiful. Adding plain blocks and alternating with a kind of single Irish chain. Set the blocks on point. The blocks themselves might all be very pretty, but when you lay them all out the design might be kind of lacking. Look at what happens when you tilt everything on point. If you want to know how to do this, Google is your friend. Here is one example of all the math done for you. Snowballs on point with sashing. Snowballs on point with sashing, alternating with plain blocks. Bonus problem: I can't fix this. It just isn't working. If all else fails, start cutting! The book Create Your Own Free-Form Quilts by Rayna Gillman suggests that if a fabric or block is ugly or you can't figure out how to use it, cut it up and piece it back together with other fabrics or block fragments. Use it as an experiment in improvisation! 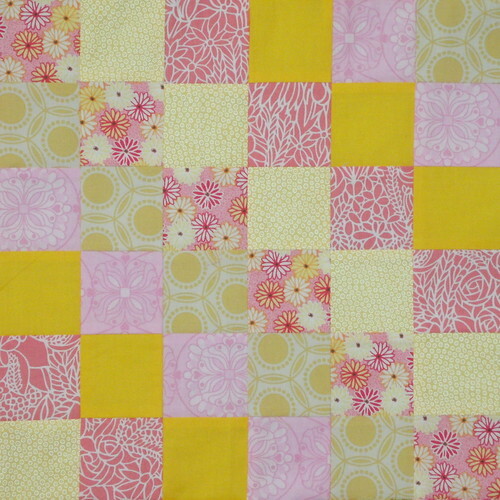 If you are too afraid to cut or the blocks are too precious--use your blocks in small doses in a backing or a border. For example, I wanted to try an improv curve block. After I had made a couple, I thought they looked alright, but they took a long time and there was no way I had the patience to make 35 of them for an entire quilt top. I scrapped that idea. But, what to do with the two orphan blocks? I cut the blocks into 3" strips. I pieced these strips into one long column, and inserted them into an otherwise boring solid-colored backing for the newly designed quilt. I really like how it turned out! The very last thought I have is that not every quilt has to be a show-stopper. If your blocks have been hanging around for awhile and you can't figure out how to make them great, it might be time to just make them good enough--there are many worthy charities that will gladly take your quilt to help comfort someone who likely won't even notice what you think are imperfections.